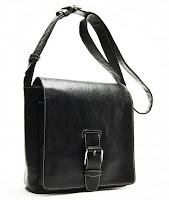 Our Daily Deal today is all about that indispensable black bag. Sleek and streamlined, this bag is great for everyday use and easily makes it through the evening plus is packed with practicality. We've reduced the price by 50% only while stocks last. Simply click below for more information and to purchase. This ultra-chic messenger bag with stylish front flap buckle detail is a classic city essential in a sleek, contemporary style. Looks and feels like genuine leather. Only you will know it's made of high end, biodegradable PU leather, an alternative animal-friendly fabrication created using environmentally sound processes. Adjustable shoulder strap and high quality hardware. Zippered main compartment under the flap for extra security. Matching briefcase/laptop bag available.